Stairs are one of the most important elements of a safe and comfortable house. A good design is the essence of stairs' functionality hence Stajder offers a wide range of inspirations to fit into each and every interior. We encourage also custom-designed projects according to customer's individual taste. 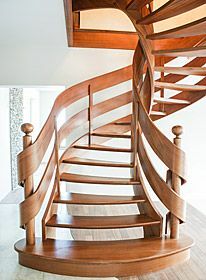 Following the world's highest standards of safety and elegance, Stajder produces all stair elements out of solid wood. That is why the perfectly durable set becomes a platform for family's everyday life. 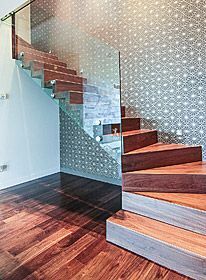 We offer the design, production and installation of wooden stair parts. 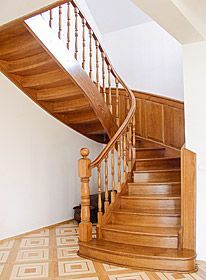 Many different types of staircases are available beginning with the simple style through the curved, spiral and flared ones. 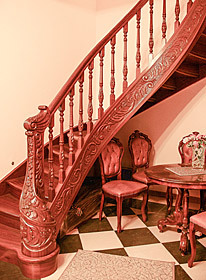 Variety of styles and fashions are a vital characteristic feature of Stajder stairs. The solution we suggest together with customer's personal needs and aesthetic taste make the final product an incomparable and unique sensation. For production of Stajder stair parts we use high quality types of wood characterized by appropriate physical and mechanical properties. The natural material crates an exclusive climate giving the interior an exceptional ambience. It is worth remembering though that the stairs especially those placed in living rooms and halls constitute an element of architectonic design and should not "compete" with the furniture and the interior but rather they should complement and expose them.